With the vast amount of death metal that comes from Poland, Vane stands out as doing something a little bit different in terms of its geography. 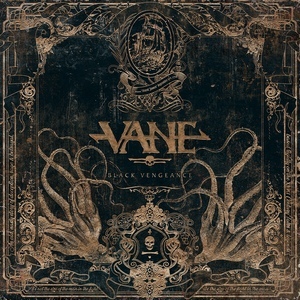 Vane plays groove-driven modern metal/melodic death metal that takes piracy as its concept. So while it’s not going off on a real limb with its intent, it is enough to warrant a glance, even if it’s only a passing one. There’s a ton of groove on Black Vengeance. There’s not a track (other than the interlude “Randy Dandy-O”) that is immune to this, but it in fact the band’s greatest asset. The crunchy guitar riffs, along with some rather shining melodies that sweep into the formula as well, get the listener engaged and moving (whether they want to or not). While one might think more variety is necessary in something like this, it works for the band and from an instrumental stand-point, there’s enough change-ups that you won’t even need to acknowledge this. So what could use a little work? The vocals do carry some variety, but it happens to come with some fluctuation in quality. There are some very solid Randy Blythe-ish rasps that lead the way, but the rest of the voices just don’t seem to reach that same pinnacle. Some of the vocals (for instance, “I Am Your Pain”), and one can hear some of the variations – resulting in some clunky lines that don’t have the power they should have. Black Vengeance is an enjoyable release overall, so long as you don’t put too much of an emphasis on the vocals. The combination of modern grooves and a melodeath spirit are a solid vehicle – with some more time and experience, perhaps Vane will become an even stronger act.